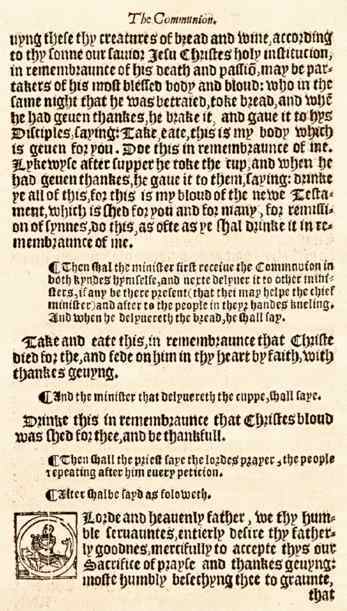 SO many as entend to be partakers of the holye Communion, shall sygnifye theyr names to the Curate over nyghte, or els in the morning, afore the begynninge of mornynge prayer, or immediatly after. And yf any of those be an open and notorious evyll lyver, so that the congregacion by hym is offended, or have done anye wronge to his neyghbours, by woord or deede: The Curate havinge knowledge thereof, shall call hym, and advertyse him, in anye wyse not to presume to the Lordes Table, untyll he have openly declared hymselfe to have truely repented, and amended hys former naughtye lyfe, that the congregacion maye thereby be satisfyed, whyche afore were offended: and that he have recompensed the parties, whome he hathe done wronge unto, or at the least declare hym selfe to be in full purpose so to doe, as soone as he conveniently maye. ¶ The same ordre shall the Curate use with those, betwyxte whome he perceyveth malyce and hatred to rayne, not sufferinge them to be partakers of the LORDES table, untyll he know them to be reconcyled. And yf one of the parties so at variaunce be content to forgeve, from the bottome of hys hearte, all that the other hathe trespassed agaynst hym, and to make amendes for that he hym selfe hath oflended: and the other partie wyll not be persuaded to a godly unitie, but remayne styll in hys frowardnesse and malyce: The Minister in that case, ought to admytte the penitent person to the holy Communion, and not hym that is obstinate. ¶ The Table havyng at the Communion tyme a fayre white lynnen clothe upon it, shall stande in the body of the Churche, or in the chauncell, where Morning prayer and Evening prayer be appoynted to bee sayde. And the Priest standing at the north syde of the Table, shall saye the Lordes prayer, with thys Collecte folowinge. ALMIGHTIE God, unto whom all heartes be open, all desyres knowen, and from whom no secretes are hyd: clense the thoughtes of our heartes by the inspiracion of thy holy spirit, that we maye perfectlye love thee, and worthely magnify thy holy name: through Christ our Lorde. Amen. ¶ Then shal the Priest rehearse distinctly all the Ten Commaundments: and the people knelyng, shal after every Commaundment aske Gods mercy for theyr transgression of the same, after thys sorte. Ministre. God spake these wordes, and sayd: I am the Lord thy God. Thou shalt have none other Goddes but me. People. Lord, have mercye upon us, and encline our heartes to kepe this lawe. Ministre. Thou shalt not make to thy selfe any graven ymage nor the likeness of any thyng that is in heaven above, or in the yearthe beneath, nor in the water under the yearth. Thou shalte not bowe downe to them, nor worshyppe them: for I the lord thy God am a gelous God, and visite the sinne of the fathers upon the children, unto the thyrde and fourth generacion of them that hate me, and shewe mercye unto thousandes in them that love me and kepe my commaundments. People. Lord, have mercye upon us, and encline our heartes to kepe thys lawe. Ministre. Thou shalte not take the name of the lord thy God in vayne: for the lord wil not holde him gilteles that taketh his name in vayne. People. Lord, have mercye upon us, and encline our. &c.
Ministre. Remembre that thou kepe holy the Sabboth day. Vi dayes shalt thou laboure and doe all that thou haste to doe, but the seventh day is the sabboth of the lorde thy god. In it thou shalte doe no maner of woork, thou and thy sonne and thy daughter, thy man servaunt, and thy maidservant, thy Catel, and the straunger that is within thy gates: for in vi days the lord made heaven and earth, the Sea, and al that in them is, and rested the seventh daye. Wherefore the Lorde blessed the seventh day, and halowed it. People. Lorde, have mercye upon us, and encline our. &c.
Ministre. Honoure thy father and thy mother, that thy day may be long in the land which the lord thy god geveth thee. Minister. Thou shalt doe no murther. Minister. Thou shalt not commit adulterie. Minister. Thou shalt not steale. Ministre. Thou shalt not beare false witnesse agaynste th neighboure. People. Lorde, have mercye upon us, and encline our heart to kepe thys lawe. Ministre. Thou shalt not covet thy neighbours house. Tho shalt not covet thy neighbours wife, nor his servaunt, nor maid, nor his oxe, nor his asse, nor any thing that is his. People. Lorde, have mercye upon us, and write al these thy lawes in our heartes we beseche thee. ¶ Then shall folowe the Collecte of the doye with one of these two Collectes folowynge for the king: the Priest standing up and saying. ALMIGHTIE God, whose kingdome is everlasting, and power infinite: have mercye upon the whole congregacion, and so rule the heart of thy chosen servaunt Edwarde the sixth, our king and governoure, that he (knowing whose minister he is) may above al thynges seek thy honoure and glory: and that we his subjectes (duely considering whose aucthoritie he hath) may faythfully serve, honour, and humbly obey him, in thee, and for thee, accordyng to thy blessed worde and ordinaunce: Throughe Jesus Christ our lord, who with thee, and the holy ghost, liveth, and reigneth ever one god, world without end. Amen. ALMIGHTIE and everlastyng god, we be taughte by thy holy word, that the heartes of kinges are in thy rule and governaunce, and that thou dooeste dispose, and turne them as it semeth best to thy godly wysedome: we humbly beeseche thee, so to dispose and governe the heart of Edwarde the sixth, thy servaunt, our king and governoure that in al his thoughts, wordes, and workes, he may ever seke thy honor and glory, and study to preserve thy people committed to his charge, in wealth, peace, and godlynes. Graunt this, O mercifull father, for thy deare sonnes sake Jesus Christ our Lorde. Amen. 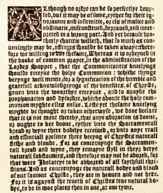 ¶ Immediatly after the Collectes, the Priest shal reade the Epistle, begynnyng thus. ¶ The Epistle written in the. Chapter of. And the Epistle ended, he shal saye the Gospel, beginning thus. The Gospell wrytten in the. Chapter of. And the Epistle and Gospel beyng ended, shal be sayd the Crede. I BELEVE in one God, the father almighty, maker of heaven and earth, and of al things visible, and invisible: And in one lorde Jesu Christ, the only begotten sonne of God, begotten of his father before al worldes: God of goddes*, light of lyght, very God of very God: begotten, not made, beeyng of one substaunce with the father, by whom al thynges were made: who for us men and for our salvacion, came downe from heaven, and was incarnate by the holy gost, of the virgyn Mary, and was made man: and was crucified also for us, under Poncius Pilate. He suffred and was buried, and the thyrd day he rose againe accordyng to the scriptures: and ascended into heaven, and sytteth at the ryght hand of the father. And he shal come agayne with glory, to judge both the quicke and the dead: Whose kyngdome shal have none ende. And I beleve in the holy gost, the Lord and gever of lyfe, who procedeth from the father and the sonne, who with the father and the sonne together, is worshipped and glorifyed, who spake by the Prophetes. And I beleve one Catholike and Apostolike churche. I acknowledge one Baptisme for the remission of synnes. And I loke for the resurreccion of the dead, and the life of the world to come. Amen. After the Crede, if there be no sermon, shal follow one of the homelies already set forth, or hereafter to be set forth by commune aucthoritie. ¶ After suche sermon, homelie, or exhortacion, the Curate shal declare unto the people whether there be any holye doyes or fasting dayes the weke folowing: and earnestly exhort them to remember the poore, saying one or moe of these Sentences folowing, as he thinketh most convenient by his discrecion. * God of God in several printings. LET your light so shine before men, that they may see your good workes, and glorifie your father whiche is in heaven. Math. v.
Laye not up for your selves treasure upon the earth, where the rust and moth doeth corrupt, and where theves break through and steal: But laye up for yourselves treasure in heaven, where neither rust nor mothe doth corrupte, and where theves do not break through and steale. Math. vi. Whatsoever you woulde that men shoulde doe unto you, even so do unto them: for thys is the lawe and the Prophetes. Math. vii. Not every one that sayth unto me, lord, lord, shal entre into the kingdom of heaven, but he that doth the wil of my father which is in heaven. Math. vii. Zache [Zaccheus] stode forth, and said unto the lord, Behold, lord, the half of my goodes I geve to the poore, and if I have done any wrong to any man, I restore fourefolde. Luke xix. Who goeth a warre fare at any tyme at his owne coste? Who planteth a vineyarde, and eateth not of the fruite thereof? Or who fedeth a flock, and eateth not of the milke of the flocke? 1 Cor. ix. If we have sowen unto you spiritual thinges, is it a great matter yf we shal reape your worldly thynges? 1 Cor. ix. Do ye not know, that they which minister about holy thynges, live of the sacrifice? They which waite of the altare are partakers with the altare? Even so hath the lord also ordained: that they whiche preache the gospel, should lyve of the gospel. 1 Cor. ix. He which soweth little, shal reape little, and he that soweth plenteously, shal reape plenteously. Let every man do according as he is disposed in his hearte; not grudgeing, or of necessitie; for God loveth a cherefull gever. 2 Cor. ix. Let him that is taught in the word, minister unto him that teacheth, in all good thinges. Be not deceived; God is not mocked. For whatsoever a man soweth, that shall he reape. Gal. vi. Whyle we have time, let us doe good unto al men, and specially unto them, which are of the household of faith. Gal. vi. Godliness is greate riches, yf a man be contented with that he hath: For we brought nothing into the world, neither may we cary any thyng out. 1 Tim. vi. Charge them which are riche in this world, that they be ready to geve, and glad to distribute, laying up in store for themselves a good foundacion, againste the time to come, that they may attayne etemall lyfe. 1 Tim. vi. To doe good, and to distribute, forgeat not, for with such sacrifices god is pleased. Heb. xiii. Whoso hath this worldes good, and seeth his brother have nede, and shutteth up his compassion from him, how dwelleth the love of god in him? 1 John iii. He that hath pietie upon the poore lendeth unto the lord; and loke, what he laieth out, it shall be paied him again. Pro. xix. Blessed be the man that provideth for the sicke and nedy; the lord shal deliver him, in the tyme of trouble. Psal. xli. ¶ Then shal the Churche wardens, or some other by them appointed, gather the devocion of the people, and put the same into the poremens boxe: and upon the offering daies appointed, every man and woman shall paye to the curate the due and accustomed offeringes: after whiche done the priest shal saye. Let us pray for the whole state of Christes Church militant here in earth. ALMIGHTIE and everliving God, which by the holye Apostle hast taught us to make prayers and supplicacions, and to geve thankes for all menne. We humbly beseche thee most mercifullye to accepte our almose [alms] and to receive these our prayers, which we offer unto thy divine Majestie, beseching thee to inspire continually the universall churche with the spirite of trueth, unitie, and concorde: And graunt that all they that dooe confesse thy holye name, may agree in the trueth of thy holy woord, and live in unitie and godlye love. We beseche thee also to save and defende all Christian Kynges, Princes, and Governoures, and speciallye thy servaunt, Edward our Kyng, that under hym we maye bee godlye and quietly governed: and graunt unto hys whole counsayle, and to all that bee putte in aucthoritie under hym, that they may truely and indifferently minister justice, to the punishement of wickednes and vice, and to the mayntenaunce of God's true religion and vertue. Geve grace (O heavenly father) to all Bisshops, Pastours, and Curates, that they maye bothe by their lyfe and doctrine sette foorth thy true and lyvely woord, and rightly and duely administer thy holye Sacramentes: and to all thy people geve thy heavenly grace, and especiallye to thys congregacion here present, that with meke hearte and due reverence they may heare and receive thy holy woord, truely serving thee in holynesse and ryghteousnesse all the dayes of theyr lyfe. And we most humbly beseche thee of thy goodnesse (O Lord) to coumfort and succour all them, whiche in this transitory lyfe bee in trouble, sorowe, nede, sickenes, or anye other adversitie: Graunt this, O father, for Jesus Christes sake, oure onely mediatour and advocate. Amen. ¶ Then shal folowe this exhortacion at certaine tymes when the Curate shal see the people negligent to come to the holy Communion. WE be come together at this time, derely beloved brethren, to fede at the Lord's supper, unto the whiche in Goddes behalf I bydde you all that be here present, and beseche you for the Lord Jesus Christes sake, that ye will not refuse to come thereto, being so lovingly called and bidden of god hymselfe. Ye knowe how grevouse and unkynde a thing it is, when a man hath prepared a riche feaste, decked his table with al kinde of provision, so that there lacketh nothing but the geastes to sit down: and yet they which be called, without any cause most unthankefully refuse to come. Which of you, in such a case, would not be moved? Who would not thynke a great injury and wrong done unto him? Wherfore, most derely beloved in Christ, take ye good hede, lest ye with drawyng yourselves from this holy supper, provoke god's indignacion against you. It is an easy matter for a man to saye, I wyll not communicate, because I am otherwyse letted [=hindered] with worldly busines: but suche excuses be not so easily accepted and allowed beefore god. If any man saye, I am a grevous sinner, and therefore am afraied to come: wherefore then doe you not repent and amend? When god calleth you, be you not ashamed to saye you will not come? When you shoulde retume to god, wyll you excuse your selfe, and saye that you be not ready? Consydre earnestly with youreselves howe lytle such feyned excuses shall avayl before God. They that refused the feaste in the gospell, because they had boughte a farme, or would trie theyr yokes of oxen, or because they were maried, were not so excused, but counted unworthy of the heavenly feast. I for my part am here present, and according to mine office, I bidde you in the name of God, I call you in Christ's behalf, I exhort you, as you love your owne salvacion, that ye wilbe partakers of thys holy Communion. And as the sonne of God did vouchesafe to yelde up hys soule by death upon the Crosse for youre health: even so it is youre duetie to receyve the Communion together in the remembraunce of hys death, as he himself commaunded. Nowe if you wyll in nowyse thus doe, considre with youreselves howe greate injurye you do unto God, and howe sore punishmente hangeth over your heades for the same. And whereas ye offend god so sore in refusing this holy Banquet, I admonishe, exhort, and beseche you, that unto this unkindnes ye wyll not adde any more. Which thing ye shah doe, if ye stande by as gazers and lokers on them that doe communicate, and be no partakers of the same yourselves. For what thing can this be accoumpted els, then a further contempt and unkindness unto god. Truely it is a great unthankfuhnes to saye naye when ye be called: but the faulte is muche greater when men stand by, and yet wyll neither eate nor drynke this holy Communion with other. I pray you what can this be els, but even to have the mysteries of Christ in derision? It is said unto all: Take ye and eate. Take and drinke ye all of thys: doe this in remembraunce of me. With what face then, or with what countenaunce shal ye hear these words? What wil this be els but a neglecting, a despysing, and mocking of the Testament of Christ? Wherefore, rather then you should so doe, depart you hence and geve place to them that be godly disposed. But when you depart, I beseche you, pondre with yourselves from whom you depart: ye depart from the lordes table, ye depart from your brethren, and from the banquete of moste heavenly fode. These thynges if ye earnestly considre, ye shal by gods grace returne to a better mynd, for the obteyning whereof, we shal make our humble peticions while we shall receive the holy Communion. Yf there be none almosen geven unto the poore, then shal the wordes of acceptyng our almes be lefte out unsayde. ¶ And some tyme shal be sayd this also, at the discrecion of the Curate. My duetie is to exhort you to consider the dignitie of the holy mistery, and the greate perel of the unworthy receiving thereof, and so to searche and examine your own consciences, as you should come holy and cleane to a moste Godly and heanenly feaste: so that in no wise you come but in the mariage garment, required of god in holy scripture; and so come and be received, as worthy partakers of suche a heavenly table. The way and meanes thereto is: First to examine your lives and conversacion by the rule of goddes commaundements, and whereinsoever ye shall perceive your selves to have offended, either by wil, word, or dede, there beewaile your owne sinful lives, confess your selfes to almightie god with ful purpose of amendment of life. And yf ye shah perceive your offences to be such, as be not only against god, but also againste your neighbours: then ye shal reconcile your selves unto them, ready to make restitucion and satisfaccion, accordyng to the uttermost of your powers, for all injuries and wronges done by you to any other: and likewise beeyng ready to forgeve other that have offended you; as you would have forgevenesse of your offences at gods hande: for otherwyse the receiving of the holy Communion doth nothyng els, but encrease your damnacion. And because it is requisite that no man shoulde come to the holy Communion but with a full truste in God's mercy, and with a quiet conscience: therefore if there be any of you which by the meanes afore said cannot quiet his own conscience, but requireth further comfort or counsel; then let him come to me, or some other discreet and learned minister of god's word, and open his griefe, that he may receive such gostlye [=spiritual] counsail, advise, and coumfort, as his conscience maye be relieved; and that by the ministery of god's word he may receive coumfort and the benefite of absolucion, to the quietting of his conscience, and avoiding of al Scruple and doubtfulnes. ¶ Then shal the Priest say thys exhortacion. DERELY beloved in the Lord: ye that mynde to come to the holy Communion of the body and bloud of our saviour Christ, muste considre what St. Paul writeth to the Corinthians, how he exhorteth all persons diligently to trye and examine themselves, before they presume to eate of that bread, and drinke of that cup: for as the benefite is great, if with a truly penitent heart and lively fayth, we receive that holy Sacrament (for then we spirituallye eate the fleshe of Christ, and drynke hys bloud, then we dwel in Christ and Christ in us, we be one with Christ, and Christ with us;) so is the daunger great, if we receive the same unworthely. For then we be giltie of the bodye and bloud of Christ our saviour. We eate and drynke our own damnacion, not consideryng the Lordes body. We kindle Goddes wrath againste us, we provoke hym to plague us with divers diseases, and sundry kynds of death. Therfore, yf any of you be a blasphemer of God, an hynderer or slaunderer of his worde, an adulturer, or be in malice or envie, or in any other grevous cryme, bewayle your sinnes, and come not to thys holy Table; lest after the takyng of that holy Sacrament, the Devill entre into you, as he entred into Judas, and fyll you ful of al iniquities, and bryng you to destruccion, both of bodye and soule. Judge therefore your selves (brethren) that ye bee not judged of the Lorde. Repent you truely for your sinnes paste have a lively and stedfaste fayth in Christe our savioure. Amende youre lyves, and be in perfecte charitie with al men, so shall ye be meete partakers of those holy misteries. And above all thynges, ye muste geve most humble and hartie thankes to God the father, the sonne, and the holy ghost, for the redempcyon of the worlde by the death and passyon of our Saviour Chryst, both God and man, who did humble hymself, even to the death upon the Crosse for us miserable synners, which laye in darkenesse and shadowe of death, that he myght make us the chyldren of God, and exalte us to everlastinge lyfe. And to thend that we shoulde alway remembre the exceding great love of our Maister, and onely Savioure Jesu Christ, thus dying for us, and the innumerable benefites, (whiche by his precyous bloud sheding) he hath obteined to us, he hath instituted and ordayned holy misteries, as pledges of his love, and continual remembraunce of hys death, to our great and endles comforte. To hym therefore, with the father and the holy ghost, let us geve (as we are most bounden) continuall thankes: submitting our selves wholy to hys holy wil and pleasure, and studying to serve him in true holyness and righteousnesse, all the dayes of oure lyfe. Amen. ¶ Then shal the Priest saye to them that come to receive the holy Communion. You that doe truly and earnestly repente you of youre synnes, and bee in love and charitie with your neighbours, and entende to heade a newe lyfe, folowyng the commaundments of god, and walking from henceforth in his holy waies: Drawe nere and take this holy Sacramente to youre comfort: make your humble confession to almightie god, before this congregacion here gathered together in his holy name, mekely knelyng upon your knees. ¶ Then shal this general confession be made, in the name of al those that are mynded to receive the holy Communion, eyther by one of them, or els by one of the ministers, or by the Priest himself, al kneling humbly upon theyr knees. ALMIGHTIE God, father of our Lorde Jesus Christe, maker of all thyngs, Judge of all men, we knowledge and bewayle oure manyfolde synnes and wyckednes, whiche we from tyme to tyme moste grevously have committed, by thoughte, woord and dede, agaynst thy devine Majestie: provokyng most justely thy wrath and indignacion agaynste us: we doe earnestlye repente, and be hartely sory for these our misdoynges: the remembraunce of them is grievouse unto us, the burthen of them is intollerable: have mercye upon us, have mercye upon us, moste mercifull father, for thy sonne oure Lorde Jesus Chrystes sake: forgeve us all that is past, and graunt that we maye ever here after serve and please thee, in newnesse of lyfe, to the honoure and glory of thy name: Through Jesus Christ our Lord. ALMIGHTIE god, our heavenly father, who of his great mercy, hath promised forgeveness of synnes to all them, whiche with hartie repentaunce and true fayth turne unto hym: have mercye upon you, pardon and deliver you from all your synnes, confirme and strength you in all goodnesse and bring you to everlasting life: through Jesus Christe our Lorde. Amen. Heare what comfortable woords our savioure Christe sayeth, to al that truly turne to hym. Come unto me all that travaile, and be heavye laden, and I shal refreshe you. So god loved the world, that he gave his onely begotten sonne to thend that al that beleve in him, should not perishe, but have life everlasting. Heare also what Sainct Paul sayeth. This is a true saying, and worthy of all men to be received, that Jesus Christe came into the world to save synners. Heare also what Sainct John sayeth. If any man sinne, we have an advocate with the father, Jesus Christ the righteous, and he is the propiciacion for our synnes. Answer. We lyfte them up unto the Lorde. Priest. Let us geve thankes unto our Lorde God. Answer. It is mete and right so to doe. Priest. It is very mete, ryght, and oure bounden duetie, that we should at al times, and in al places, geve thankes unto thee, O lord holy father, almightie everlastyng God. ¶ Here shal folowe the proper Preface accordinge to the tyme (yf there be any specially appointed,) or els immediatly shal folowe. Therefore with Angelles, &c.
¶ Upon Christmas daye, and seven dayes after. BECAUSE thou diddest geve Jesus Christ, thine onely sonne, to be borne as this daye for us, who by the operacion of the holy goste, was made very man, of the substaunce of the Virgin Mary his mother, and that without spot of synne, to make us cleane from al synne. Therefore, &c.
¶ Upon Easter daye, and seven dayes after. BUT chiefly are we bounde to prayse thee, for the glorious resurreccion of Thy sonne Jesus Christ our Lorde; for he is the very Paschall lambe which was offered for us, and hath taken away the sinne of the worlde, who by his death hath destroyed death, and by his rysing to lyfe agayne hath restored to us ever lasting lyfe. Therefore, &c.
¶ Upon the Ascencion daye, and seven dayes after. THROUGHE thy moste dere beloved sonne, Jesus Christ our lorde, who after his moste glorious resurreccion manifestlye appeared to all hys Apostles, and in their sighte ascended up into heaven, to prepare a place for us, that where he is, thether might we also ascend, and reigne with him in glorye. There fore, &c.
¶ Upon Whitsondaye, and six dayes after. THROUGH Jesus Christ our Lorde, accordyng to whose most true promise, the holye ghoste came downe thys daye from heaven, with a sodayne great sound, as it had been a myghty wynde, in the lykenesse of fyery tongues, lyghting upon the Apostles, to teache them, and to leade them to all trueth, geving them both the gyft of diverse languages, and also boldnes with fervent zeale, constantly to preache the gospell unto all nacions, whereby we are brought out of darknesse and errour, into the cleare lyghte and true knowledge of thee, and of thy sonne Jesus Christ. Therefore with. &c.
¶ Upon the feast of Trinitie onely. IT is very mete, ryght, and our bounden duetie, that we shoulde at all tymes, and in all places, geve thanks to thee, O Lord, almightie and everlasting God, whiche art one God, one Lorde, not one onely person, but three persons in one substaunce: For that which we beleve of the glorye of the father, the same we beleve of the sonne, and of the holye ghoste without anye dyfference, or inequalitie. Therefore with. &c.
Holye, holye, holye, Lorde God of hostes: heaven and yearthe are full of thy glory: glory be to thee, O lord, most high. ¶ Then shal the Priest, kneling down at Goddes borde, say in the name of all them that shal receive the Communion, this praier folowyng. ¶ Then the Priest standing up shal saye, as foloweth. ALMIGHTY God oure heavenly father, whiche of thy tender mercye dyddest geve thine onely sonne Jesus Christ, to suffre death upon the crosse for our redempcion, who made there (by hys one oblacion of hymselfe once offered) a full, perfecte and sufficiente sacrifice, oblacion, and satisfaccion, for the synnes of the whole worlde, and dyd institute, and in hys holye Gospell commaund us to continue, a perpetuall memorye of that his precious death, untyll hys comynge agayne: Heare us O mercyefull father wee beeseche thee; and graunt that wee, receyving these thy creatures of bread and wyne, accordinge to thy sonne our Savioure Jesus Christ's holy institucion, in remembraunce of his death and passion, maye be partakers of his most blessed body and bloud: who, in the same night that he was betrayed, tooke bread, and when he had geven thanks, he brake it, and gave it to his Disciples, sayinge: Take, eate, this is my bodye which is geven for you. Doe this in remembraunce of me. Lykewyse after supper he tooke the cup, and when he had geven thankes, he gave it to them, sayinge: Drink ye all of this, for this is my bloud of the new Testament, whiche is shed for you and for many, for remission of synnes: do this as oft as ye shah drinke it in remembraunce of me. ¶ Then shal the minister first receyve the Communion in both kyndes hymselfe, and next deliver it to other ministers, yf any be there present (that they may help the chief minister,) and after to the people in their handes kneling. ¶ And when he delyvereth the bread, he shall saye. Take and eate this, in remembraunce that Christ dyed for thee, and feede on him in thy hearte by faythe, with thankesgeving. Drinke this in remembraunce that Christ's bloude was shed for thee, and be thankefull. ¶ Then shall the Priest saye the Lordes prayer, the people repeating after him every peticion. ¶ After shalbe sayde as foloweth. O LORDE and heavenly father, we thy humble servaunts entierly desire thy fatherly goodnes, mercifully to accept this our Sacrifice of prayse and thanksgeving: most humbly beseching thee to graunt, that by the merites and death of thy sonne Jesus Christe, and through fayth in his bloud, we and al thy whole church may obtayne remission of oure synnes, and all other benefytes of his Passion. And here we offre and presente unto thee, O lord, our selfes, our soules, and bodies, to be a reasonable holy, and lively Sacrifice unto thee: humbly beseching thee that al we which be partakers of this holy Communion, maye bee fulfylled with thy grace and heavenhy benediccion. And although we bee unworthy throughe oure manifolde sinnes to offre unto thee any Sacrifice: yet we beseche thee to accept this our bounden duetie and service, not weighing our merites, but pardoning our offences, through Jesus Christ our Lord; by whom and with whom, in the unitie of the holy ghost, all honour and glory bee unto thee, O father almightie, world without ende. Amen. ALMIGHTIE and everliving God, we most hartely thank thee, for that thou dooest vouchsafe to fede us, whiche have duely receyved these holye misteries, with the spirituall foode of the most precious body and bloud of thy sonne our saviour Jesus Christ, and doest assure us thereby of thy favoure and goodnes towarde us, and that we bee verye membres incorporate in thy mistical body, which is the blessed companie of all faythfull people, and be also heyrs, through hope, of thy everlasting kingdom, by the merites of the most precious death and Passion of thy deare sonne. We now most humbly beseche thee, O heavenly father, so to assiste us with thy grace, that we may continue in that holy felowship, and do al such good workes, as thou hast prepared for us to walk in: through Jesus Christ our Lord, to whom, with thee and the holy ghost, be all honour and glorye, world without ende. Amen. ¶ Then shalbe sayd or song. GLORYE bee to God on hyghe. And in yearth peace, good wyll towardes men. We prayse thee, we blesse thee, we worshippe thee, we glorifye thee, we geve thanks to thee for thy greate glorye, O Lorde God heavenly kyng, God the father almightie. O lord the onely begotten sonne Jesu Christ: O lord God, Lambe of god, sonne of the father, that takest away the sinnes of the worlde, have mercye upon us: Thou that takest away the sines of the world, have mercye upon us. Thou that takest awaye the sinnes of the world, receyve oure prayer. Thou that syttest at the ryght hande of God the father, have mercye upon us: For thou only art holy, Thou only arte the Lord. Thou only, (O Christ,) with the holy ghost, art most high in the glory of god the father. Amen. THE peace of GOD which passeth al understanding kepe youre heartes and mynds in the knowledge and love of GOD, and of his sonne Jesus Christ our Lord: And the blessing of god almightye, the father, the sonne, and the holy ghost, be amongest you and remayne with you always. Amen. ¶ Collectes to be saide after the Offertorie, when there is no Communyon, every suche daye one. And the same maye be sayd also as often as occasion shal serve, after the Collectes, eyther of Morning and Evening prayer, Communion or Letany, by the discrecion of the minister. ASSIST us mercyfully, O lord, in these our supplicacions and prayers, and dispose the waye of thy servaunts toward the attaynment of everlasting salvacion: that among al the chaunges and chaunces of this mortall lyfe, they may ever be defended by thy most gracious and ready helpe; throughe Christ our Lorde. Amen. O ALMIGHTIE Lord and everliving god, vouchsafe, we beseche thee, to directe, sanctifye, and governe, both oure heartes and bodies, in the wayes of thy lawes, and in the woorks of thy commaundments: that through thy most mightie proteccion, both here and ever, we may be preserved in body and soule: through our lorde and savioure Jesus Christ. Amen. GRAUNT, we beseche thee, Almightie God, that the wordes which we have heard this daye, with our outward eares, may through thy grace be so grafted inwardly in oure heartes, that they may bring forth in us the fruite of good living, to the honour and prayse of thy name: through Jesus Christ our Lorde. Amen. PREVENT [=Guide] us, O Lord, in al our doinges, with thy most gracious favoure, and further us with thy continual helpe, that in all our works begon, continued, and ended in thee, we may glorifye thy holy name, and finallye by thy mercie obtayne everlasting lyfe: through Jesus Christ our Lorde. Amen. ALMIGHTY God, the fountayn of al wisdom, which knowest our necessities before we ask, and oure ignoraunce in asking: we beseche thee to have compassion upon our infirmities, and those things, whiche for our unworthinesse we dare not, and for oure blindnesse we cannot aske, vouchsafe to geve us for the worthines of thy sonne Jesus Christe our Lord. Amen. ALMIGHTYE God, whiche haste promysed to heare the peticions of them that aske in thy sonnes name: we beseche thee mercyfully to enclyne thyne eares to us that have made nowe oure prayers and supplicacions unto thee: and graunt that those things which we faythfully asked according to thy wyll, may effectually be obteyned to the reliefe of our necessitie, and to the setting foorth of thy glory: Through Jesus Christ our Lord. Amen. ¶ Upon the holy dayes, yf there be no Communion, shalbe said at that is appoynted at the Communion, until the ende of the Homelie, concluding with the general prayer, ' for the whole state of Christ's churche militante here in earth: ' and one or moe of these Collectes before rehearsed, as occasyon shal serve. ¶ And there shal be no celebracion of the lordes Supper, except there be a good noumbre to communicate wyth the Priest, accordynge to hys discrecion. ¶ And yf there be not above twentie persons in the Parishe of discretion to receive the Communion: yet there shalbe no Communion, excepte foure, or three at the least communicate wyth the Prieste. And in Cathedrall and Collegiate churches, where be many Priestes and Deacons, they shall at receyve the Communion wyth the minister every Sonday at the least, excepte they have a reasonable cause to the contrary. ¶ And to take away the supersticion, whiche any person hothe, or myghte have in the bread and wyne, it shall suffyse that the bread bee such, as is usuall to bee eaten at the Table wyth other meates, but the best and purest wheate bread, that conveniently maye be gotten. And yf any of the bread or wine remayne, the Curate shal have it to hys owne use. 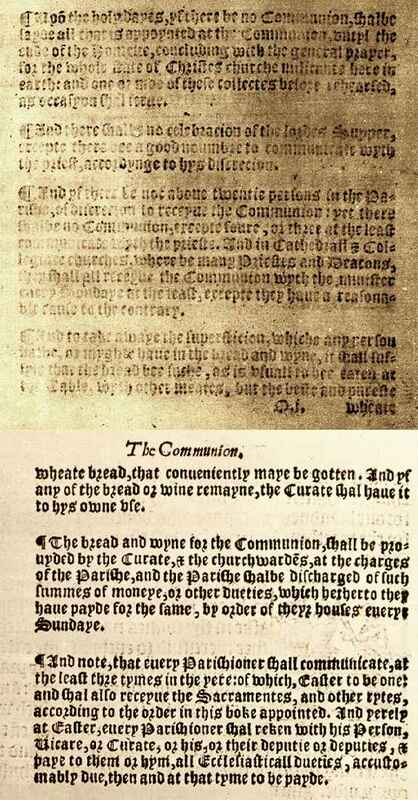 ¶ The bread and wyne for the Communion shall be provyded by the Curate, and the churchwardens, at the charges of the Parishe, and the Parishe shalbe discharged of such summes of money, or other dueties, which hetherto they have payde for the same, by order of theyr houses every Sondaye. ¶ And note, that every Parishioner shalt communicate, at the least thre tymes in the yere: of which, Easter to be one: and shal also receyve the Sacramentes, and other rytes, according to the order in this boke appointed. And verely at Easter, every Parishioner shal reken with his Person, [parson] Vicare, or Curate, or his, or their deputie or deputies, and paye to them or hym all Ecclesiasticall dueties, accustomabty due, then and at that tyme to be payde. Although no ordre can be so perfectlye devised, but it may be of some, eyther for theyr ignoraunce and infermitie, or els of malice and obstinacie, misconstrued, depraved, and interpreted in a wrong part: And yet because brotherly charitie willeth, that so much as conveniently may be, offences shoulde be taken awaye: therefore we willing to doe the same. 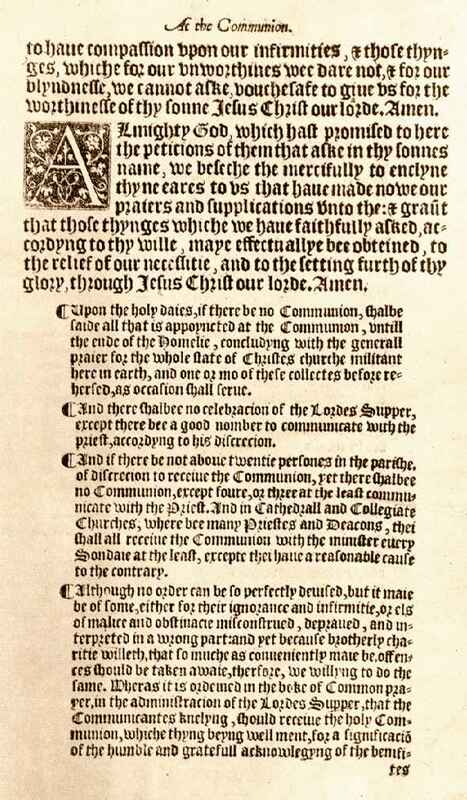 Whereas it is ordeyned in the booke of common prayer, in the administracion of the Lord's Supper, that the Communicants knelyng shoulde receyve the holye Communion. 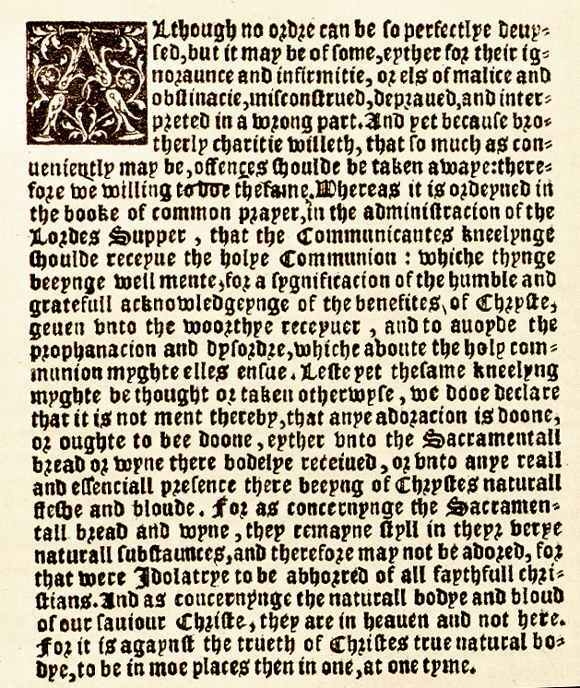 whiche thynge beyng well mente, for a sygnificacion of the humble and gratefull acknowledgyng of the benefites of Chryst, geven unto the woorthye receyver, and to avoyde the prophanacion and dysordre, which about the holy Communion myght els ensue: Leste yet the same kneelyng myght be thought or taken otherwyse, we dooe declare that it is not ment thereby, that any adoracion is doone, or oughte to bee doone, eyther unto the Sacramentall bread or wyne there bodily receyved, or unto anye reall and essencial presence there beeyng of Christ's naturall fleshe and bloude. For as concernynge the Sacramentall bread and wyne, they remayne styll in theyr verye naturall substaunces, and therefore may not be adored, for that were Idolatrye to be abhorred of all faythfull christians. And as concernynge the naturall body and blood of our saviour Christ, they are in heaven and not here. For it is agaynst the trueth of Christes true natural bodye, to be in moe places then in one, at one tyme. 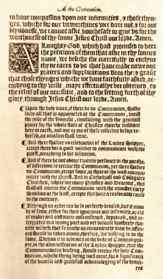 The paragraph directly above is commonly called the "Black Rubric", or the Declaration on Kneeling. It was inserted into the 1552 Book at the last minute, and, as a result, its occurrence varies among different printings. Typically it was inserted as a separate leaf. Below at left is an earlier printing, which entirely omits it (the top part of this image is actually a 'print-though' from the back of the page which has been reversed and enhanced to make it at least somewhat readable). In the center is the Black Rubric printed on a separate page, to be inserted into the Book. 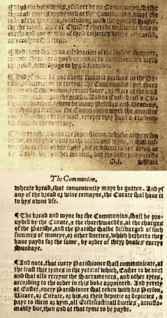 At the right is a later printing with the Black Rubric placed fourth among those at the end of the Communion Service (rather than last as it is in the text above). Clicking on one of these images will bring up a larger (~100K in size) readable version.